Located in the lovely area of Rayong Beach, VIP Chain Resort enjoys a commanding position in the beaches, restaurants, sightseeing hub of Rayong. The resort lies 20. Km from the city center and provides accessibility to important town facilities. With the city's main attractions such as Kon Ao Beach, Suan Komolram Meditation Center, Mae Ramphueng Beach within close reach, visitors to the resort will just love its location. At VIP Chain Resort, the excellent service and superior facilities make for an unforgettable stay. To name a few of the resort's facilities, there are: an excellent restaurant with Thai-European cuisine (buffet breakfast), Wi-Fi (free in public areas, in the villas - 150 THB/day, 500 THB/week, 1,200 THB/month for 1 account), car park, airport transfer, meeting facilities, family room. All guest accommodations feature thoughtful amenities to ensure an unparalleled sense of comfort. The resort's fitness center, outdoor pool, spa, massage, pool (kids) are ideal places to relax and unwind after a busy day. 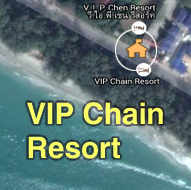 VIP Chain Resort is your one-stop destination for quality resort accommodations in Rayong.